Vacuum Grip Logo on Plier Handles. 01/21/2019: Added Vacuum Grip No. 65 Thin-Nose Combination Pliers. 01/28/2016: Added Vacuum Grip No. 46 Combination Pliers. 01/16/2016: Added Vacuum Grip No. 27 Thin-Nose Combination Pliers. 01/06/2016: Minor update to pliers table, added Vacuum Grip No. 37 Combination Pliers. 01/04/2016: Added Vacuum Grip No. 66 Thin-Nose Combination Pliers. 12/31/2015: Added Vacuum Grip No. 45 Combination Pliers. 12/28/2015: Added Early Vacuum Grip No. 49 Combination Pliers. 12/22/2015: Added Vacuum Grip No. 36 Combination Pliers. 12/21/2015: Added Vacuum Grip No. 49 Combination Pliers. 12/17/2015: Added Vacuum Grip No. 65 Thin Combination Pliers. 12/02/2015: Added a Vacuum Grip 208 Tapered Punch. 01/15/2012: Minor updates to company history. 05/30/2011: Added Vacuum Grip No. 105 Slip-Joint Ignition Pliers. 04/24/2011: Added Vacuum Grip No. 7A Bent-Nose Battery Pliers. 03/28/2011: Added Vacuum Grip No. 5 Midget Ignition Pliers. 03/26/2011: Added Vacuum Grip No. 26 Thin-Nose Combination Pliers. 03/25/2011: Added Vacuum Grip No. 57 Lineman's Pliers. 03/17/2011: Added Vacuum Grip No. 35 Combination Pliers. 03/13/2011: Added Vacuum Grip No. 42 Combination Pliers. 03/11/2011: Added Vacuum Grip No. 56 Lineman's Pliers. 02/28/2011: Added Vacuum Grip No. 57 Lineman's Pliers. 01/24/2011: Added a Forged Steel Products No. 12 Splicing Clamp. 12/15/2010: Added Vacuum Grip No. 7A Bent-nose Battery Pliers. 11/02/2010: Added Vacuum Grip Early No. 26 Thin-nose Combination Pliers. 10/27/2010: Added Vacuum Grip Early No. 56 Lineman's Pliers. 08/01/2010: Added Vacuum Grip No. 196 Needlenose Pliers with Side-Cutters. 07/21/2010: Added Vacuum Grip No. 96 Needlenose Pliers. 07/07/2010: Added Vacuum Grip Indian Motorcycle Specialty Pliers. 06/22/2010: Added Vacuum Grip No. 87 Diagonal Cutters. 04/30/2010: Added Vacuum Grip No. 7 Battery Pliers. 04/15/2010: Added Vacuum Grip No. 27 Thin-nose Combination Pliers. 11/01/2009: Added Vacuum Grip Early No. 46 Combination Pliers. 07/03/2009: Updated product table, renumbered figures. 06/19/2009: Minor update to company history. 05/29/2009: Added Vacuum Grip No. 87 Diagonal Cutters. 10/21/2008: Added Vacuum Grip No. 308 Fixed-Pivot Angle-Nose Battery Pliers. 09/20/2008: Added Vacuum Grip No. 66 Thin-Nose Combination Pliers. 05/22/2008: Added Vacuum Grip No. 34 Pliers. 03/08/2008: Added Vacuum Grip No. 62 Pliers. 02/11/2008: Added Vacuum Grip No. 70-A Lockring Pliers. 12/14/2007: Added Vacuum Grip No. 61 Pliers. 12/03/2007: Added Vacuum Grip No. 7 Battery Pliers. 11/10/2007: Added Vacuum Grip No. 14 Long-Handled Steeldraulic Pliers. 10/21/2007: Added Vacuum Grip No. 49 Slip-Joint Pliers. 10/18/2007: Added Vacuum Grip No. 137 Slip-Joint Pliers. 10/16/2007: Added Vacuum Grip No. 25 Thin-Nose Combination Pliers. 09/12/2007: Added Vacuum Grip No. 56 Lineman's Pliers. 08/13/2007: Added Vacuum Grip No. 87 Diagonal Cutters. 04/05/2007: Added Vacuum Grip No. 36 Slip-Joint Pliers. 03/26/2007: Added Vacuum Grip Early No. 65 Pliers. 02/18/2007: Added Vacuum Grip No. 31 Brake Spring Pliers. 02/14/2007: Reorganized sections, added a Vacuum Grip No. 13 Piston Ring Groove Cleaner. 02/06/2007: Filled in some company history, added logo and Vacuum Grip No. 17 End Nippers. 02/04/2007: Moved to a separate page, added Vacuum Grip No. 9 Water Pump Pliers and Vacuum Grip No. 86 Diagonal Cutters. 02/02/2007: Added Vacuum Grip No. 46 Pliers and Vacuum Grip No. 386 Diagonal Cutters. 01/27/2007: Added Vacuum Grip No. 65 Slip-Joint Pliers. 01/22/2007: Added Vacuum Grip 70-A Lock-Ring Pliers and Vacuum Grip No. 14 Straight-Handled Steeldraulic Pliers. 12/15/2006: Added Vacuum Grip No. 308 Slip-Joint Battery Pliers. 12/10/2006: Added Vacuum Grip 47 Slip-Joint Pliers. 12/09/2006: Added Vacuum Grip 86 Diagonal Cutters. 10/30/2006: Added Vacuum Grip No. 207 Parrot-Head Pliers and Vacuum Grip No. 14 Steeldraulic Pliers. Forged Steel Products is best known for their line of "Vacuum Grip" pliers, tools of exceptional quality with a distinctive handle pattern. In addition to producing notable tools, Forged Steel Products also played an important role in the development of the Snap-On Wrench Company, and was eventually acquired by Snap-on Tools. Currently we don't have very much information regarding Forged Steel Products, but have pieced together parts of their history from public documents and from their association with Snap-on. The Forged Steel Products Company was founded in 1920 in Newark, New Jersey as a maker of tools and other steel forgings. The notice of incorporation at the left was published in the April 1920 issue of the Steel and Metal Digest and lists the founders as John H. Gibson, Horace G. Oliver, and Lionel L. Meyers. The company appears to have been operated primarily by the Myers family (listed as "Meyers" in the notice), as Earl W. "Bill" Myers was the company's president from the 1920s onward. (Myers apparently went by his middle name, and his name is sometimes incorrectly reported as "William E. Myers".) The company's principal products were pliers, cutters, and related hand tools. Additional information on the company's formation can be seen in the notice at the left, published in the June 24, 1920 issue of Iron Age. This notice lists several people previously associated with Kraeuter & Company as the organizers, including E.W. Myers as mentioned above. One additional notice is helpful for establishing the officers of the company. The notice at the left was published in the July 1920 issue of The American Cutler and lists E.W. Myers as president, Harry D. Neff as vice-president, and George Z. Premont as treasurer and general manager. Also of interest is the stated initial production of 5,000 pairs per day, to be "rapidly increased", showing that the company intended to be a major manufacturer from the beginning. The company's first location was at 141-143 Frelinghuysen Avenue in Newark, New Jersey, based on an early trademark application, and the company's earliest tools are marked with the Newark location. Within a few years Forged Steel Products had moved to Newport, Pennsylvania, where it occupied a large brick factory previously used by a textile company. A real estate report on present-day Newport places the move to Newport in 1922, and mentions that the historic factory building is still known as the "Plier Factory". Forged Steel Products sold their products under the brand name "Vacuum Grip", a name derived from the distinctive gripping pattern forged into the handles. This handle pattern design featured rows of dimples resembling suction cups, and was described and illustrated in design patent #D57,252, issued to Earl W. Myers on March 8 of 1921. Early Vacuum Grip pliers generally included a patent notice with the "3-8-21" date. In 1924 Bill Myers met with Stanton Palmer and other management of the Snap-on Wrench Company, a meeting that would prove important for both companies. Myers showed his pliers and apparently impressed the Snap-on executives with their quality. Snap-on had been looking for a line of pliers to offer through their Motor Tool Specialty Company distributor, and so a sales agreement was negotiated between the two companies. In addition to selling their pliers through Snap-on, Forged Steel Products agreed to act as a contract manufacturer for open-end wrenches, punches, and chisels, using some of the excess forging capacity at the factory in Newport. These other tools were marked as part of the new Blue Point brand established by Snap-on in the mid 1920s. The sales agreement apparently worked out well for both companies. Vacuum Grip pliers were prominently shown in the Snap-on catalogs, and Snap-on's direct sales force introduced the pliers to a much greater market. Snap-on expanded rapidly during the 1920s, and the Blue Point tool line proved to be very successful. By 1931 Forged Steel Products had become one of Snap-on's biggest creditors, and when Snap-on's president Stanton Palmer died that year, Bill Myers assumed the additional role of president of Snap-on. Both companies continued to prosper during the 1930s, despite the difficult business conditions caused by the Great Depression. Bill Myers served as president of Snap-on until his death in 1939. After the death of Myers, Joseph Johnson became president of both Snap-on and Forged Steel Products. Johnson was one of the original founders of Snap-on and was deeply familiar with the operations of both companies. Only two patents are known to have been issued to Forged Steel Products, and both are design patents for plier handles. However, only the first patent is known to have been used on actual products: the handle pattern described and illustrated by design patent #D57,252, issued to Earl W. Myers on March 8, 1921. Although this design patent clearly illustrates rows of dimples resembling suction cups, the patent document doesn't actually mention suction cups or use the phrase "vacuum grip". In 1920 Forged Steel Products applied for a trademark on "Vacuum Grip", with the first use date listed as June 1, 1920. On the trademark application the company reports its address as 141-143 Frelinghuysen Avenue in Newark, New Jersey, and the application is signed by Earl W. Myers as President. The trademark was issued as #141,355 on April 19, 1921. For some reason this early trademark is not in the USPTO trademarks ("TESS") database, and as a result it was only recently found. The information in the application provided a valuable confirmation of the presumed initial Newark location. 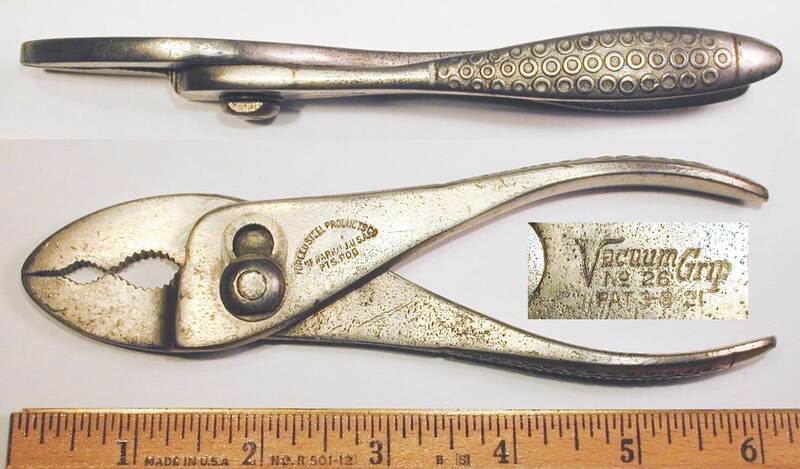 In the late 1930s or 1940, Forged Steel Products filed another trademark registration for a design showing a plier handle with the text "Vacuum Grip". At this point the company had been using Vacuum Grip as a brand name for 20 years, yet despite the long usage of the mark, the new trademark application was denied. The company appealed the denial, but a decision by the Court of Customs and Patent Appeals on June 30, 1941 upheld the denied application. (See 121 F.2d 492 In re FORGED STEEL PRODUCTS CO. for the full story.) The rationale for the denied application was that if the tool handles incorporated suction-cup like dimples, then the term "vacuum grip" was merely descriptive of an essential element of the product, and therefore did not warrant trademark protection. The company's earliest tools were marked with their Newark (N.J.) location, indicating production in the years 1920-1922. Within this period some earlier production can be distinguished based on markings and construction features; refer to the text for examples. Many of the Vacuum Grip tools were sold through Snap-on dealers, and these tools were generally marked with Snap-on style date codes. It's not known whether all of the Vacuum Grip production was similarly marked, although it would have made sense to do so. In any event, the frequent presence of date codes means that the manufacturing date for Vacuum Grip tools can often be placed within a particular year. When we refer to a date code in this article, the Snap-on style single digit code is implied, unless otherwise clarified. In later years Vacuum Grip pliers were marked with "Made in U.S.A." forged into the underside of the handles. We haven't pinpointed the date of the transition to this new marking, but it was probably in the late 1930s or early 1940s. Forged Steel Products produced a relatively small number of different models of pliers, small enough that we can easily summarize them in a table. Table 2 below lists all of the known pliers, together with some basic information such as the style and length. The table also shows the approximate year when each particular model was first offered, subject of course to limitations of catalog resources. Models for which an early example made in Newark is known will be assumed to have been offered in 1920. Please note that the table is not yet complete, due to a lack of catalog coverage. We still occasionally discover a "new" model and then update the table. No. 7 Battery Fixed 7 1929 Listed in 1929 Snap-on catalog. No. 7A Bent-Nose Battery Fixed 7 1929? Bent-Nose model. No. 9 Water Pump Slip-Joint 9 1937 Tongue-and-Groove ("Channellock") Design. No. 13 Specialty Slip-Joint 10.5 1931 Slip-Joint Adjustment Mechanism. Listed in 1931 Snap-on catalog. No. 14 Steeldraulic Fixed 5.5 1931 Listed in 1931 Snap-on catalog. Three handle styles: Bow, Bent, and Long Bent. No. 16 Chain Repair Pliers Fixed 7 1931 Listed in 1931 Snap-on catalog. No. 25 Thin Combination Slip-Joint 5 1920 Very early example with block letter marking. No. 34 Combination Slip-Joint 4.5 1937 With side cutters. No. 35 Combination Slip-Joint 5 1929 With side cutters. Offered in 1929 Snap-on catalog. No. 36 Combination Slip-Joint 6 1929 With side cutters. No. 37 Combination Slip-Joint 7 1920? With side cutters. No. 42 Combination Slip-Joint 12 1929 Offered in 1929 Snap-on catalog. No. 46 Combination Slip-Joint 6 1920 Very early example with block letter marking. No. 47 Combination Slip-Joint 7 1926 Heavy-Duty Pattern. No. 49 Combination Slip-Joint 9 1920 Heavy-Duty Pattern. No. 56 Linemen's Pliers Fixed 6 1920 Early example with Newark marking. No. 57 Linemen's Pliers Fixed 7 1926 Example with "New England" style head. No. 65 Thin Combination Slip-Joint 5 1920 With side cutters. No. 66 Thin Combination Slip-Joint 6 1920 With side cutters. No. 67 Thin Combination Slip-Joint 7 1929? With side cutters. No. 87 Diagonal Cutters Fixed 7 1926 Observed with both bow and fashioned handles. No. 197 Needle Nose Fixed 7 1926 With side-cutters. No. 207 Parrot-Head Combination Slip-Joint 7 1929 Listed in 1934 Snap-on catalog. No. 297 Needle Nose Fixed 8 No catalog reference yet. No. 308 Battery Fixed 8 1934 Early version, later models used slip-joint. No. 308 Battery Slip-Joint 8 1937 Earlier models had fixed pivot. No. 386 Diagonal Cutters Fixed 6 1929 Heavy-duty pattern. Bow handles. No. 597 Needle Nose Fixed 7 1927 Valve pin pliers with grooved jaws. N/A Specialty Fixed 7 Indian Motorcycle valve cover pliers. Information on the history of the Forged Steel Products Company was found in an online article on the Snap-on Company History. Additional information was obtained from The Snap-on Story, an account of the development of Snap-on from 1920 through 1960 published by Snap-on in 1960. This publication definitively states that Forged Steel Products was acquired by Snap-on in 1945. Currently we do not have any catalogs from Forged Steel Products itself. However, as the company's line of pliers were distributed by Snap-on, the catalogs from Snap-on provide information for the Vacuum Grip line of pliers. Product information was obtained from a number of Snap-on catalogs, including Catalog "H" (1931), Catalog "J" (1933), Catalog "N" (1939), Catalog "S" (1948), Catalog "U" (1953), and Catalog "X" (1960). This section will present several examples believed to represent the earliest production of the company, based on the markings and handle pattern. Fig. 1. Vacuum Grip No. 25 5 Inch Thin-Nose Combination Pliers, with Insets for Side View and Marking Detail, ca. 1920. Fig. 1 shows a very early pair of Vacuum Grip No. 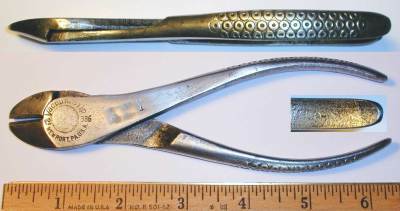 25 5 inch thin-nose combination pliers, stamped with "Forged Steel Products Co." and "Newark, N.J. U.S.A." near the pivot, with "Vacuum Grip" and "No. 25" on the reverse (see lower inset). The overall length is 5.0 inches, and the finish is nickel plating. Several details of the markings and construction of these pliers indicate a very early production date, possibly just after the "Vacuum Grip" design had been developed. Especially notable is the simple block letter marking for "Vacuum Grip", instead of the fancier stylized logo form used later. Also notable is the lack of the patent notice, otherwise almost universally marked on the company's pliers. An important construction detail to note is that the handle pattern on these pliers has a ridge around the outside of the pattern, a feature missing from later examples. This pattern is closer to that shown in the patent illustration (see patent #D57,252), but may have caused difficulty for the die makers. Later examples generally have the suction cups fading away at the edges of the pattern; see for example the Vacuum Grip No. 36 Pliers shown in a later figure. 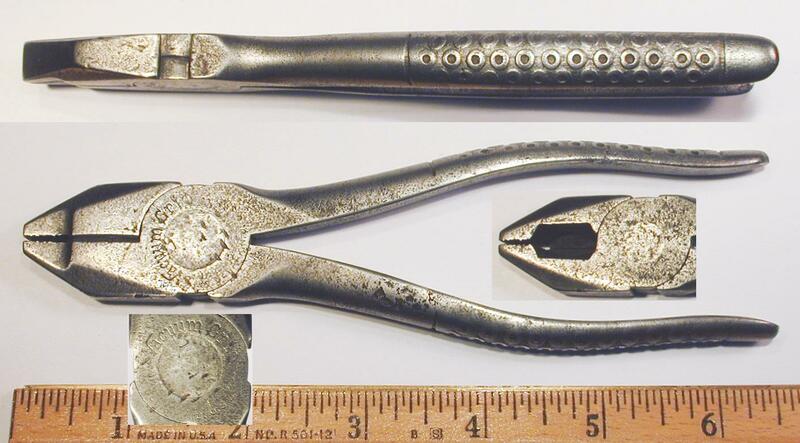 One last note is that the marking for Newark (New Jersey) on these pliers is less commonly seen, with most examples of Vacuum Grip tools being marked for Newport (Pennsylvania). Forged Steel Products was located in Newark from 1920-1922 and moved to Newport in 1922. The next two figures show early examples of the No. 26 pliers. Fig. 2. Vacuum Grip No. 26 6 Inch Thin-Nose Combination Pliers, with Insets for Side View and Reverse Detail, ca. 1920-1921. Fig. 2 shows an early pair of Vacuum Grip No. 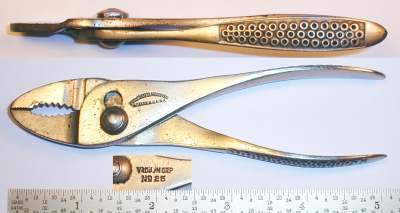 26 6 inch thin-nose combination pliers, stamped "Forged Steel Products Co." and "Newark, N.J. U.S.A." on the front, with the Vacuum Grip logo and model number on the reverse, as seen in the lower inset. The overall length is 6.1 inches, and the finish is nickel plating, with extensive losses due to wear. The "Newark" marking indicates production from 1920-1922, before the company's move to Newport, Pennsylvania. An important construction detail to note is that the handle pattern on these pliers has a ridge around the outside of the pattern, a feature missing from later examples. This pattern is closer to that shown in the patent illustration (see patent #D57,252), but may have caused difficulty for the die makers. Also notable is the lack of the patent date, otherwise almost universally marked on the company's pliers. Fig. 3. Vacuum Grip No. 26 6 Inch Thin-Nose Combination Pliers, with Insets for Side View and Reverse Detail, ca. 1921-1922. Fig. 3 shows an early pair of Vacuum Grip No. 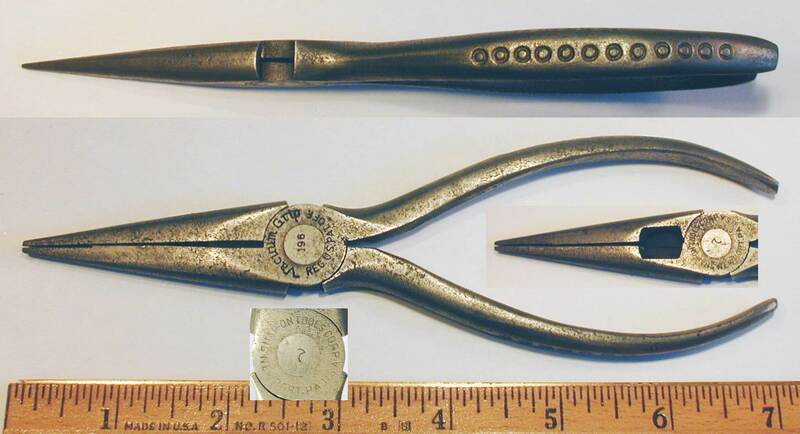 26 6 inch thin-nose combination pliers, stamped "Forged Steel Products Co." and "Newark, N.J. U.S.A." with "Pats. Pdg." on the front. The reverse is stamped with the Vacuum Grip logo, model number, and "Pat 3-8-21", as seen in the lower inset. The overall length is 6.1 inches, and the finish is nickel plating. These pliers have an extra "Pats. Pdg." notice on the front, but the corresponding patents (if issued) are not known. The next two figures show early examples of the No. 46 combination pliers. Fig. 4. Vacuum Grip Early No. 46 Combination Pliers, with Insets for Side View and Marking Detail, ca. 1920. Fig. 4 shows a very early pair of Vacuum Grip No. 46 slip-joint combination pliers, stamped with "Forged Steel Products Co." and "Newark, N.J. U.S.A." near the pivot, with "Vacuum Grip" and the model number on the reverse (see lower inset). The overall length is 5.9 inches, and the finish is nickel plating, though now worn off in some areas. As with the previous figure, several details of the markings and construction of these pliers indicate a very early production date. Most notable is that the "Vacuum Grip" brand is stamped in a simple block font, instead of the stylized logo form found in later examples. Also notable is the lack of the patent notice, otherwise almost universally marked on the company's pliers. 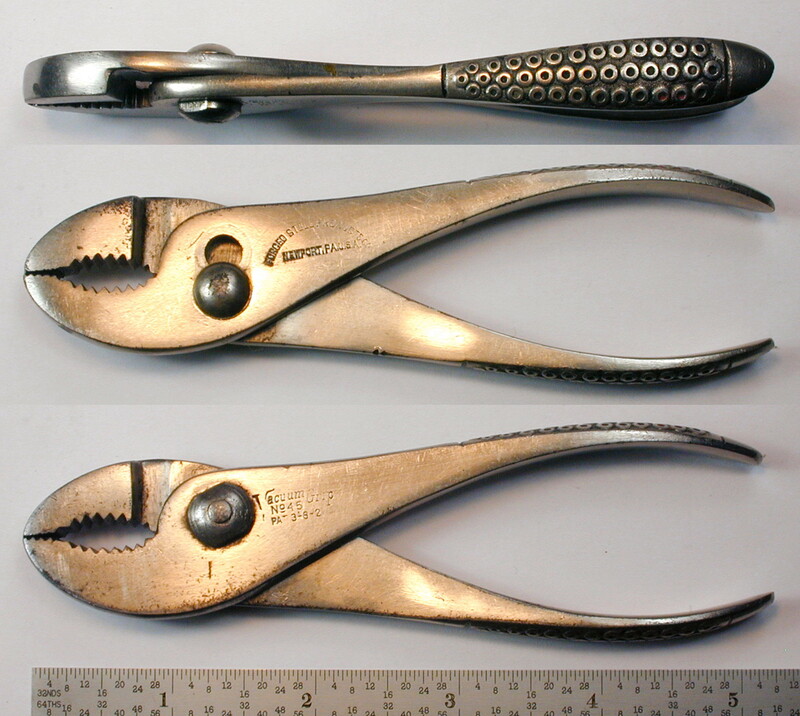 In addition, the pliers have a distinct "ridge" around the dimple pattern on the handles, closely matching the pattern illustrated with the design patent. Fig. 5. Vacuum Grip No. 46 Combination Pliers, with Insets for Side View and Marking Detail, ca. 1921-1922. Fig. 5 shows a slightly later (but still early) pair of Vacuum Grip No. 46 pliers, marked "Forged Steel Products Co." and "Newark, N.J. U.S.A." near the pivot, with the "Vacuum Grip" logo and "Pat. 3-8-21" on the reverse (see lower inset). The pliers are marked with the patent date "Pat. 3-8-21", corresponding to the Myers design patent #D57,252. The presence of the patent notice itself at least indicates production in 1921 or later. 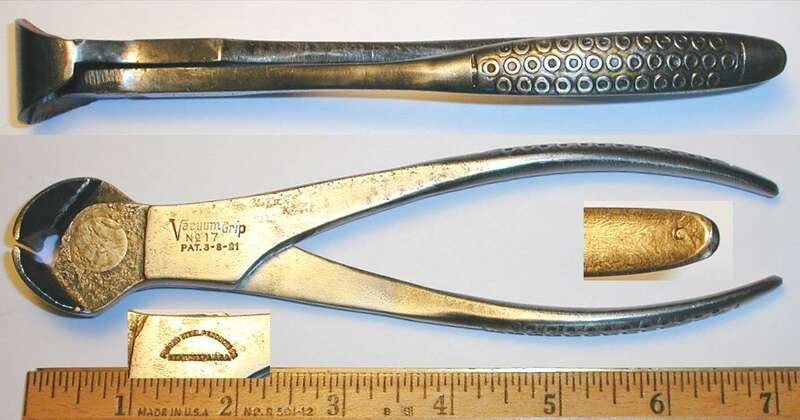 As noted for the previous example, these pliers have a distinct "ridge" around the dimple pattern on the handles, closely matching the pattern illustrated with the design patent. Fig. 6. Vacuum Grip No. 65 5 Inch Thin-Nose Combination Pliers, with Insets for Side View and Marking Detail, ca. 1921-1922. Fig. 6 shows an early pair of Vacuum Grip No. 65 thin-nose slip-joint combination pliers, stamped "Forged Steel Products Co." and "Newark, NJ. U.S.A." with "Pats. Pdg." on the front. The reverse is marked "Vacuum Grip No. 65" and "Pat. 3-8-21", as seen in the lower inset. The overall length is 5.2 inches, and the finish is polished nickel plating. As with the previous figures, these pliers are marked for the Newark location, indicating that these are of early production. The early production is also indicated by ridge enclosing the handle pattern, a feature missing from later examples. The extra "Pats. Pdg." 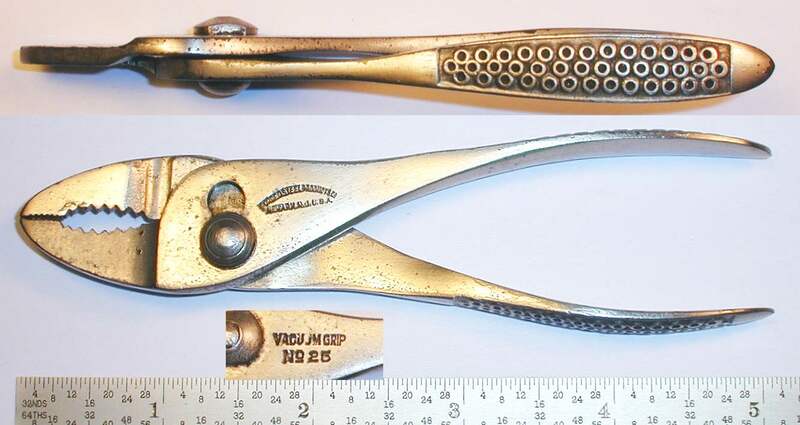 patent notice on these pliers is of particular interest, as it suggests that there were additional patents filed for this model beyond the standard handle design patent. An extensive patent search has failed to locate the corresponding patent, if any, so it's possible that the patent claims were denied. Slip-joint pliers were among the first tools produced by Forged Steel Products. Combination pliers are generally considered to be slip-joint pliers with gripping surfaces for both flat and round objects. Forged Steel Products offered combination pliers in many sizes and with options such as such as side-cutters or thin-nose construction. Fig. 7. Vacuum Grip No. 45 5 Inch Combination Pliers, with Insets for Reverse and Side View, ca. 1922 to Mid 1920s. Fig. 7 shows a pair of Vacuum Grip No. 45 5 inch slip-joint combination pliers, stamped with the Vacuum Grip logo and "Pat. 3-8-21" near the pivot, with "Forged Steel Products Co." and "Newport, PA. U.S.A." on the reverse. The overall length is 5.1 inches, and the finish is nickel plating. 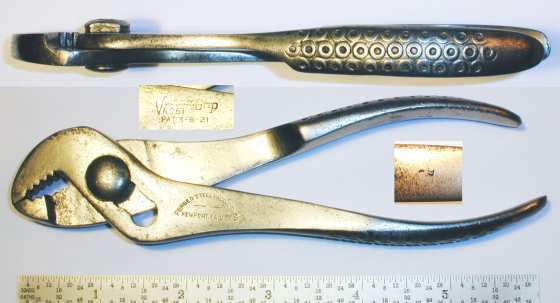 The top inset shows a side view of the pliers, illustrating the patented gripping pattern on the handles. The patent date on the pliers corresponds to the Myers design patent #D57,252. 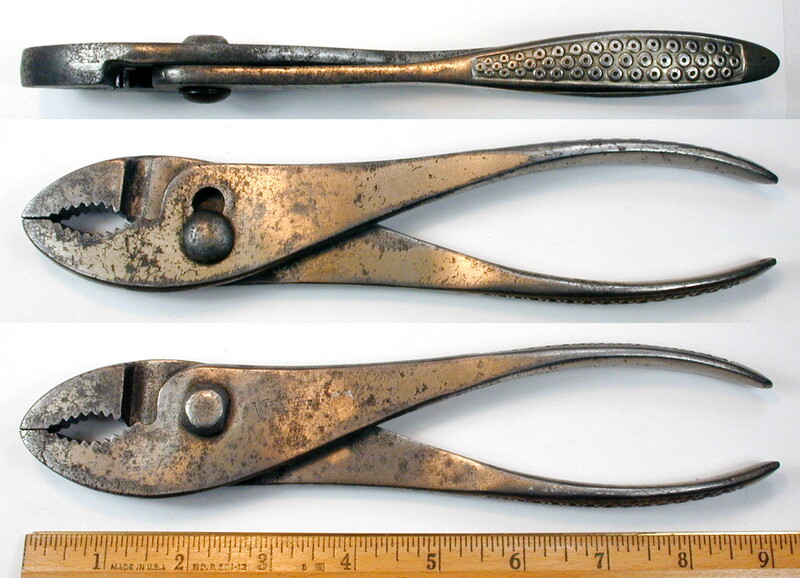 These pliers are not marked with a date code, which suggests production in the early to mid 1920s. The next three figures show two generations of the No. 46 combination pliers, including two early example previously shown in the section on Early Production, but repeated here under their functional group. Fig. 8A. Vacuum Grip Early No. 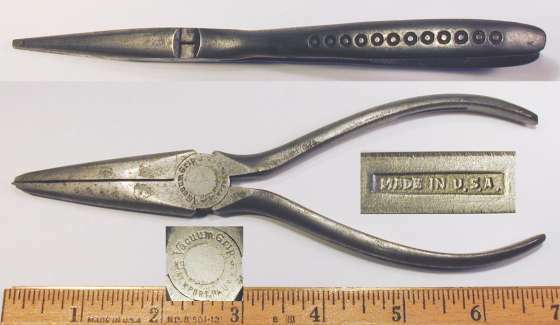 46 6 Inch Combination Pliers, with Insets for Side View and Marking Detail, 1920. Fig. 8A shows a very early pair of Vacuum Grip No. 46 slip-joint combination pliers, stamped with "Forged Steel Products Co." and "Newark, N.J. U.S.A." near the pivot, with "Vacuum Grip" and the model number on the reverse (see lower inset). Fig. 8B. Vacuum Grip No. 46 6 Inch Combination Pliers, with Insets for Side View and Marking Detail, ca. 1921-1922. Fig. 8B shows a slightly later (but still early) pair of Vacuum Grip No. 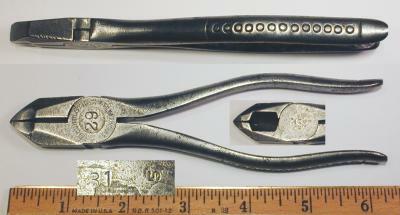 46 pliers, marked "Forged Steel Products Co." and "Newark, N.J. U.S.A." near the pivot, with the "Vacuum Grip" logo and "Pat. 3-8-21" on the reverse (see lower inset). Fig. 9. Vacuum Grip No. 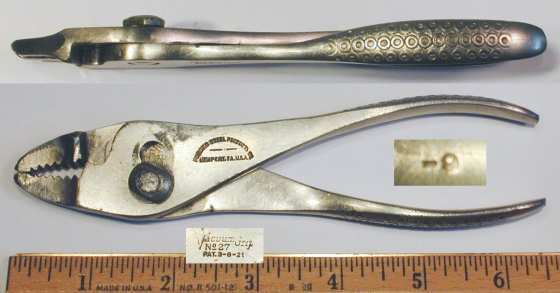 46 6 Inch Combination Pliers, with Insets for Reverse, Side View, and Marking Detail, 1927. Fig. 9 shows a later pair of Vacuum Grip No. 46 pliers, stamped with the "Vacuum Grip" logo and "Pat. 3-8-21" near the pivot, with "Forged Steel Products Co." and "Newport, PA. U.S.A." on the reverse. The overall length is 6.4 inches, and the finish is nickel plating, with minor losses due to wear. The patent date corresponds to the Myers design patent #D57,252. The lower inset shows the stamped "-7" date code on the underside of one handle, indicating production in 1927. Note that the nose of these pliers is more elongated when compared to the two earlier examples, and the pliers are slightly longer as well. These changes show the evolution of the design during the mid 1920s. Fig. 10. Vacuum Grip No. 47 7 Inch Combination Pliers, with Insets for Handle Pattern and Marking Detail, ca. Late 1930s to Early 1940s. Fig. 10 shows a pair of Vacuum Grip No. 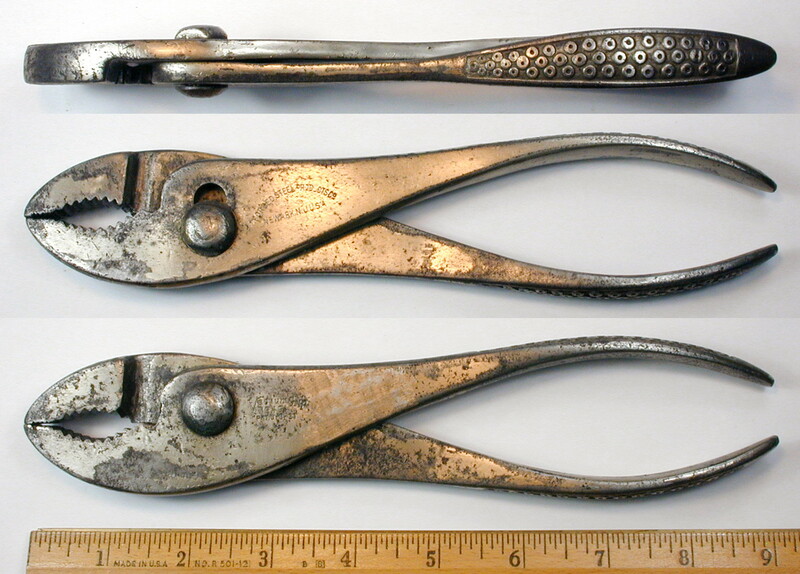 47 7 inch slip-joint combination pliers, marked "Forged Steel Products Co." and "Newport, PA U.S.A." near the pivot, with "Vacuum Grip" and "Reg. U.S. Pat. Off." on the reverse (see upper inset). The middle and lower insets show the handle detail, with "Vacuum Grip" incorporated into the gripping pattern, and "Made in U.S.A." forged into the underside of the handles. The markings on these plers are unusual in that they anticipate the "Vacuum Grip" trademark registration that was later denied. Forged Steel Products went to the trouble of incising "Vacuum Grip" into the dies for the handle pattern, as well as replacing the earlier patent date with a "Reg. U.S. Pat. Off." marking. The next three figures show examples of the No. 49 combination pliers, with interesting production differences showing the evolution of the design. Fig. 11. Vacuum Grip No. 49 9 Inch Combination Pliers, with Insets for Reverse and Side View, ca. 1920-1922. Fig. 11 shows a very early pair of Vacuum Grip No. 49 9 inch slip-joint combination pliers, stamped with the Vacuum Grip logo and "Pat. 3-8-21" near the pivot, with "Forged Steel Products Co." and "Newark, N.J. U.S.A." on the reverse. The overall length is 9.0 inches, and the finish is nickel plating, with losses due to wear and rust. 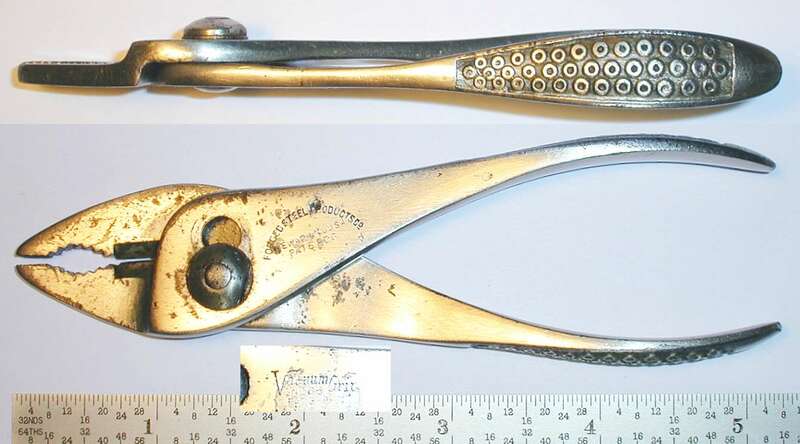 The top inset shows a side view of the pliers, illustrating the patented gripping pattern on the handles. Note that there is a ridge at the edges of the pattern, a feature typically seen on earlier production when the company was still in Newark. The Newark marking indicates production in the 1920-1922 range. Fig. 12. Vacuum Grip No. 49 9 Inch Combination Pliers, with Insets for Reverse and Side View, ca. 1922-1923. The top inset shows a side view of the pliers, illustrating the patented gripping pattern on the handles. Note that there is a ridge at the edges of the pattern, a feature usually seen only on earlier production when the company was still in Newark. The ridge around the gripping pattern suggests a 1922-1923 production date. Fig. 13. Vacuum Grip No. 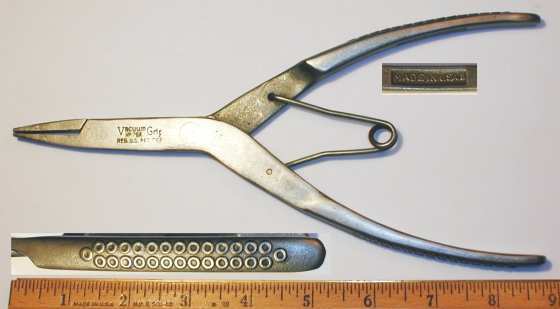 49 9 Inch Combination Pliers, with Insets for Side View and Marking Detail, 1931. Fig. 13 shows a slightly later pair of Vacuum Grip No. 49 9 inch slip-joint combination pliers, stamped with the Vacuum Grip logo and "Pat. 3-8-21" near the pivot, with "Forged Steel Products Co." and "Newport, PA. U.S.A." on the reverse (see lower inset). The middle inset shows the "-1" date code stamped into the underside of one handle. Although this is not a standard Snap-on date code, it likely indicates production in 1931, as an extension from the "-7", "-8", and "-9" codes used in the 1920s. 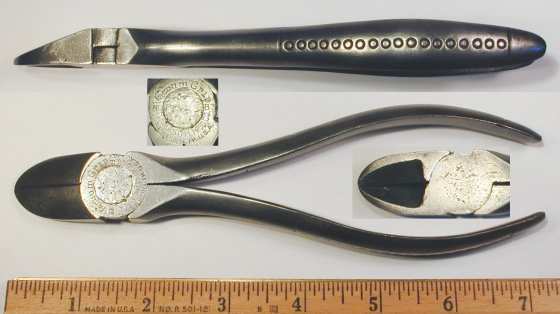 Note that the nose of these later pliers is less rounded than the earlier example, and that the overall length is slightly longer. In addition, the bow-shaped handles of the earlier production have evolved to a form with compound curves. This next figure shows the largest of the Vacuum Grip heavy-duty pliers, the model No. 42 pliers. Fig. 14. Vacuum Grip No. 42 12 Inch Combination Pliers, with Insets for Side View and Marking Detail, 1930. Fig. 14 shows a pair of Vacuum Grip No. 42 12 inch slip-joint combination pliers, stamped with "Forged Steel Products Co." and "Newport, PA. U.S.A." near the pivot, with the Vacuum Grip logo and "Pat. 3-8-21" on the reverse (see middle inset). The overall length is 11.8 inches. The finish is plain steel, with a few traces of the original nickel plating. The lower inset shows the "-0" date code stamped into the underside of one handle, indicating production in 1930. Forged Steel Products offered combination pliers with side cutters in four models, with nominal lengths of 4, 5, 6, and 7 inches. All of the models featured nearly flush rivets to allow the pliers to cut close to a surface, a fine design feature sometimes overlooked by competitors. Fig. 15. Vacuum Grip No. 34 4 Inch Combination Pliers with Side Cutters, with Insets for Side View and Marking Detail, 1937. Fig. 15 shows a pair of Vacuum Grip No. 34 4 inch slip-joint combination pliers with side cutters, stamped with the "Vacuum Grip" logo and "Pat. 3-8-21" near the pivot, with "Forged Steel Products Co." and "Newport, PA. U.S.A." on the reverse (see lower inset). The overall length is 4.4 inches, and the finish is nickel plating. The middle inset shows a close-up of small marking on the underside of one handle, believed to be a "7" date code for 1937. Fig. 16. Vacuum Grip No. 35 5 Inch Combination Pliers with Side Cutters, with Insets for Reverse, Side View, and Marking Detail, ca. Late 1930s to 1940s. Fig. 16 shows a pair of Vacuum Grip No. 35 5 inch slip-joint combination pliers with side cutters, stamped with the "Vacuum Grip" logo and "Pat. 3-8-21" near the pivot, with "Forged Steel Products Co." and "Newport, PA. U.S.A." on the reverse (see middle inset). The pliers are also marked with "Made in U.S.A." forged into the underside of the handles. The overall length is 5.0 inches, and the finish is nickel plating, with extensive losses due to wear. Fig. 17. Vacuum Grip No. 36 Combination Pliers with Side Cutters, with Insets for Reverse, Side View, and Marking Detail, 1929. Fig. 17 shows an earlier pair of Vacuum Grip No. 36 6 inch slip-joint combination pliers with side cutters, stamped with "Vacuum Grip" and "Pat. 3-8-21" near the pivot, with "Forged Steel Products Co." and "Newport, PA. U.S.A." on the reverse. The overall length is 6.4 inches, and the finish is nickel plating, with extensive losses due to rust and wear. The lower inset shows a close-up of the "9-" date code stamped on the underside of one handle, indicating production in 1929. Fig. 18. Vacuum Grip No. 36 Combination Pliers with Side Cutters, with Insets for Side View and Marking Detail, ca. Late 1930s to 1940s. Fig. 18 shows a later pair of Vacuum Grip No. 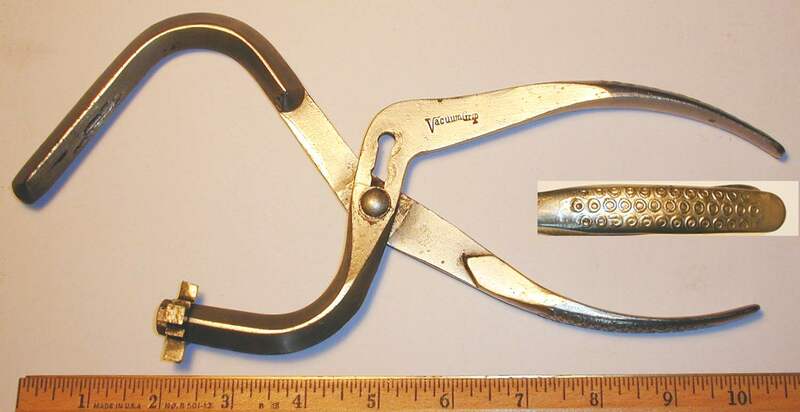 36 6 inch slip-joint combination pliers with side cutters, marked "Forged Steel Products Co." and "Newport, PA. U.S.A." near the pivot, with "Vacuum Grip" and "Pat. 3-8-21" on the reverse (see lower inset). The overall length is 6.4 inches, and the finish is nickel plating. The middle inset shows the "Made in U.S.A." marking forged into the underside of the handles. Fig. 19. Vacuum Grip No. 37 7 Inch Combination Pliers with Side Cutters, with Insets for Reverse and Side View, ca. 1922 to Mid 1920s. Fig. 19 shows a pair of Vacuum Grip No. 37 7 inch slip-joint combination pliers with side cutters, stamped with the Vacuum Grip logo and "Pat. 3-8-21" near the pivot, with "Forged Steel Products Co." and "Newport, PA U.S.A." on the reverse. The overall length is 7.1 inches, and the finish is nickel plating, with extensive losses due to rust and pitting. These pliers are very similar to the model 137 pliers (shown in the next figure) but have bow-shaped instead of fashioned handles. The more rounded nose on this example probably indicates early production. Fig. 20. Vacuum Grip No. 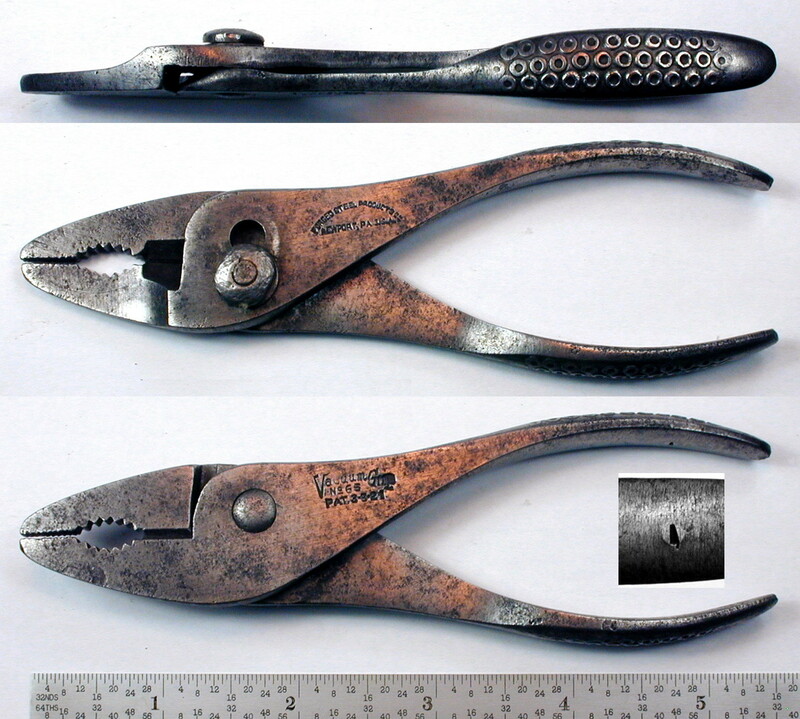 137 7 Inch Combination Pliers with Side Cutters, with Insets for Side View and Marking Detail, 1927. Fig. 20 shows a pair of Vacuum Grip No. 137 7 inch slip-joint combination pliers with side cutters, marked with the Vacuum Grip logo and "Pat. 3-8-21" near the pivot, with "Forged Steel Products Co." and "Newport, PA U.S.A." on the reverse (see lower left inset). The lower right inset shows the "-7" date code stamped on the underside of one handle, indicating production in 1927. The Vacuum Grip No. 137 pliers were offered in the Snap-on catalogs as early as 1926. 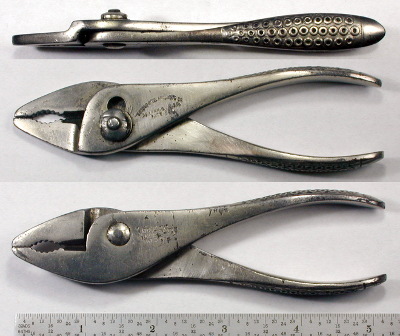 These pliers were shown in the section on Early Production but are repeated here under their functional group. Fig. 21. Vacuum Grip No. 25 5 Inch Thin-Nose Combination Pliers, with Insets for Side View and Marking Detail, ca. 1920. Fig. 21 shows a very early pair of Vacuum Grip No. 25 5 inch thin-nose combination pliers, stamped with "Forged Steel Products Co." and "Newark, N.J. U.S.A." near the pivot, with "Vacuum Grip" and "No. 25" on the reverse (see lower inset). One last note is that the marking for Newark (New Jersey) on these pliers is less commonly seen, with most examples of Vacuum Grip tools being marked for Newport (Pennsylvania). Newark was the earlier location of the company, and Forged Steel Products is believed to have moved to Newport around 1922. The next two figures show examples of the No. 26 pliers, both with early production dates. Fig. 22. Vacuum Grip No. 26 6 Inch Thin-Nose Combination Pliers, with Insets for Side View and Reverse Detail, ca. 1920-1921. Fig. 22 shows an early pair of Vacuum Grip No. 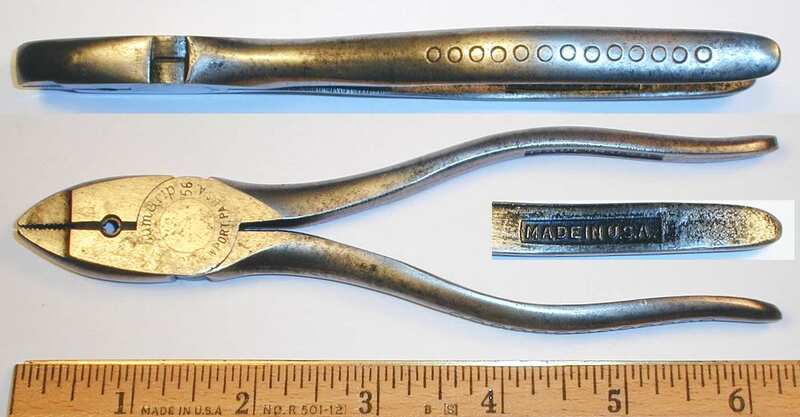 26 6 inch thin-nose combination pliers, stamped "Forged Steel Products Co." and "Newark, N.J. U.S.A." on the front, with the Vacuum Grip logo and model number on the reverse, as seen in the lower inset. Fig. 23. Vacuum Grip No. 26 6 Inch Thin-Nose Combination Pliers, with Insets for Side View and Reverse Detail, ca. 1921-1922. Fig. 23 shows an early pair of Vacuum Grip No. 26 6 inch thin-nose combination pliers, stamped "Forged Steel Products Co." and "Newark, N.J. U.S.A." with "Pts. Pdg." on the front. The reverse is stamped with the Vacuum Grip logo, model number, and "Pat 3-8-21", as seen in the lower inset. These pliers have an extra "Pts. Pdg." notice on the front, but the corresponding patents (if issued) are not known. Fig. 24A. Vacuum Grip No. 27 7 Inch Thin-Nose Combination Pliers, with Insets for Reverse and Side View, ca. 1921-1922. Fig. 24A shows an early pair of Vacuum Grip No. 27 7 inch thin-nose slip-joint combination pliers, stamped with the "Vacuum Grip" logo and "Pat. 3-8-21" near the pivot, with "Forged Steel Products Co." and "Newark, N.J. U.S.A." plus "Pts. Pdg." on the reverse. The overall length is 7.0 inches, and the finish is nickel plating, with extensive losses due to wear. The "Newark" marking indicates production from 1920-1922, before the company's move to Newport, Pennsylvania. 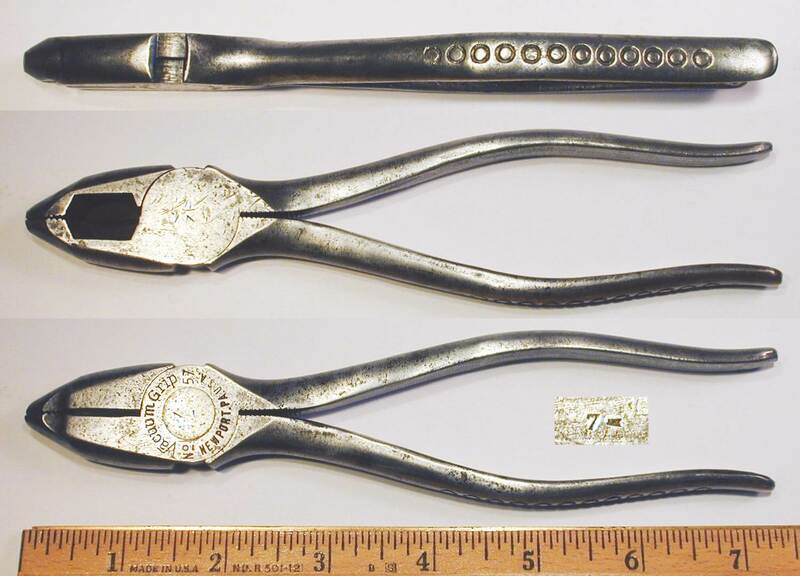 Since the pliers are also marked with the 1921 patent date, these pliers were made from 1921-1922. Fig. 24B. Vacuum Grip No. 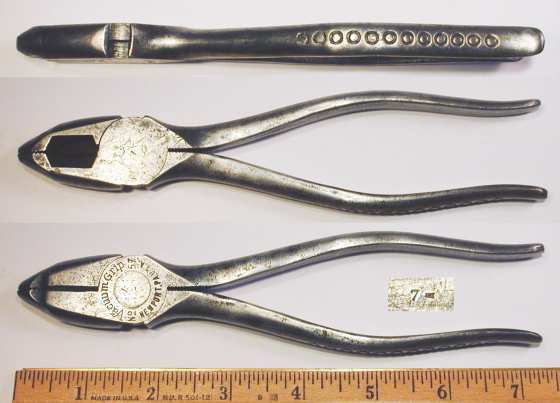 27 7 Inch Thin-Nose Combination Pliers, with Insets for Side View and Marking Detail, 1929. Fig. 24B shows a later pair of Vacuum Grip No. 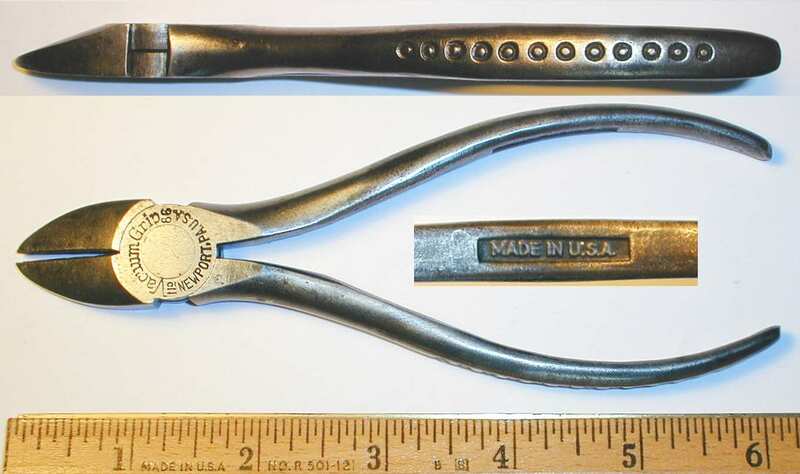 27 7 inch thin-nose slip-joint combination pliers, stamped with "Forged Steel Products Co." and "Newport, PA. U.S.A." near the pivot, with the "Vacuum Grip" logo and "Pat. 3-8-21" on the reverse (see lower inset). The overall length is 6.5 inches, and the finish is nickel plating. The middle inset shows a close-up of the "-9" marking stamped on the underside of one handle, believed to be a date code for 1929. Although the jaws of the pliers have been slightly modified by grinding, the remaining nickel plating shows that the tapering thin profile was made at the factory. This family of thin-nose combination pliers featured jaws equipped for gripping both flat and rounded objects, and with cutting edges as well. The 1929 Snap-on catalog offered three models of this design as Nos. 65, 66, and 67, but by 1931 only the No. 65 model was still listed. The next figures show several generations of the No. 65 thin combination pliers, a model that featured jaws equipped for gripping both flat and rounded objects, and with cutting edges as well. The first pair of pliers were shown in the section on Early Production but are repeated here under their functional group. Fig. 25A. Vacuum Grip No. 65 Thin-Nose Combination Pliers, with Insets for Side View and Marking Detail, ca. 1921-1922. Fig. 25A shows an early pair of Vacuum Grip No. 65 thin-nose slip-joint combination pliers, stamped "Forged Steel Products Co." and "Newark, NJ. U.S.A." with "Pats. Pdg." on the front. The reverse is marked "Vacuum Grip No. 65" and "Pat. 3-8-21", as seen in the lower inset. 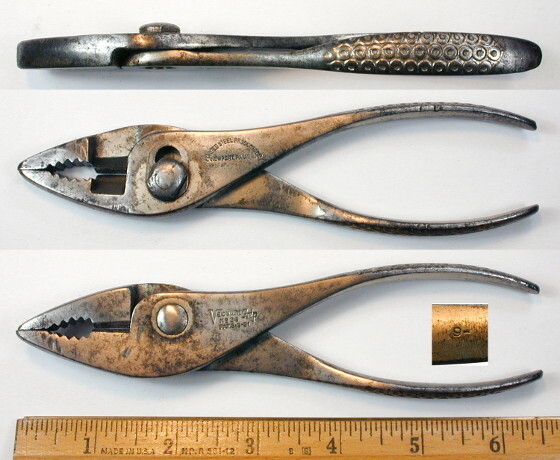 The Newark location indicates that these pliers are of early production. The early production is also indicated by ridge enclosing the handle pattern, a feature missing from later examples. Fig. 25B. Vacuum Grip No. 65 Thin-Nose Combination Pliers, with Insets for Reverse and Side Views, ca. 1921-1922. Fig. 25B shows another early pair of Vacuum Grip No. 65 thin-nose pliers, very similar to the first early example but with slight differences in the handle pattern. The front is stamped "Vacuum Grip No. 65" and "Pat. 3-8-21", with "Forged Steel Products Co." and "Newark, NJ. U.S.A." plus "Pats. Pdg." on the reverse, as seen in the middle inset. The Newark location indicates that these pliers are of early production. Note that on this example the handle pattern is not enclosed by a ridge, but there is a dividing line at the right end visible in the top inset. The change in the handle pattern probably indicates slightly later production than the first example. Fig. 26. Vacuum Grip No. 65 Thin-Nose Combination Plierswith Cutters, with Insets for Reverse, Side View, and Marking Detail, 1931. Fig. 26 shows a later pair of Vacuum Grip No. 65 slip-joint combination pliers with cutters, stamped with the "Vacuum Grip" logo and "Pat. 3-8-21" near the pivot, with "Forged Steel Products Co." and "Newport, PA. U.S.A." on the reverse. The underside of one handle is also stamped with a "1" date code for 1931, shown as a close-up in the lower inset. The overall length is 5.5 inches, and the finish is plain steel, with extensive pitting due to rust. The top inset shows the thin profile of the pliers. Fig. 27. Vacuum Grip No. 65 Thin-Nose Combination Pliers, with Insets for Side View and Marking Detail, ca. Late 1930s to 1940s. Fig. 27 shows a later pair of Vacuum Grip No. 65 slip-joint combination pliers, marked "Forged Steel Products Co." and "Newport, PA. U.S.A." near the pivot, with "Vacuum Grip" and "Pat. 3-8-21" on the reverse (see lower inset). An additional marking "Made in U.S.A." is forged into the underside of the handles, as shown in the middle inset. The overall length is 5.5 inches, and the finish is polished steel. Fig. 28. Vacuum Grip No. 66 6 Inch Thin-Nose Combination Pliers, with Insets for Reverse and Side View, ca. 1921-1922. Fig. 28 shows an early pair of Vacuum Grip No. 66 6 inch thin-nose slip-joint combination pliers with side cutters, stamped with the Vacuum Grip logo and "Pat. 3-8-21" near the pivot, with "Forged Steel Products Co." and "Newark, N.J. U.S.A." plus "Pats. Pdg." on the reverse. The overall length is 6.0 inches, and the finish is nickel plating. Fig. 29. Vacuum Grip No. 66 6 Inch Thin-Nose Combination Pliers, with Insets for Side View and Marking Detail, ca. 1922-1930. Fig. 29 shows a later pair of Vacuum Grip No. 66 6 inch thin-nose slip-joint combination pliers with side cutters. 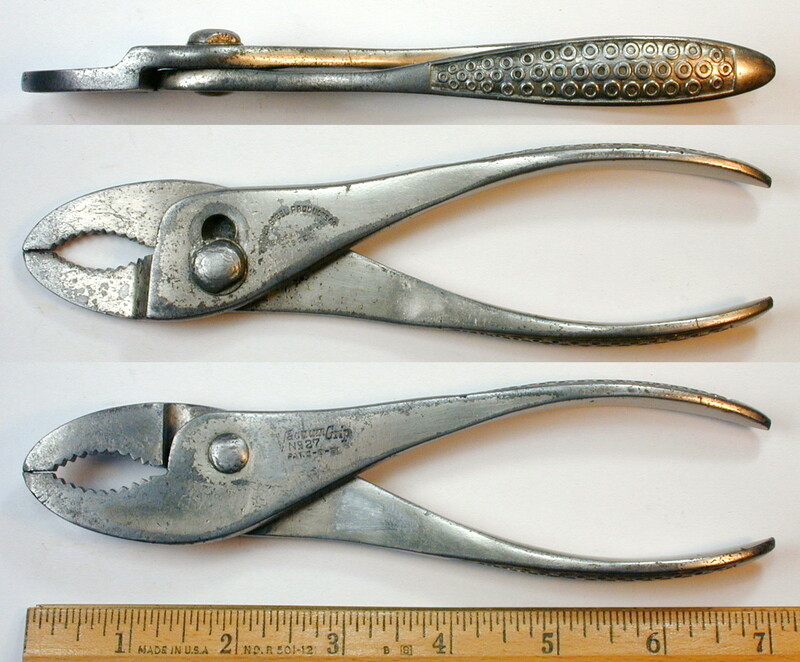 The pliers are stamped "Forged Steel Products Co." and "Newport, PA U.S.A." near the pivot, with the Vacuum Grip logo and "Pat. 3-8-21" on the reverse (see lower inset). The overall length is 6.2 inches. The finish is polished steel, with a few traces of the original nickel plating. Fig. 30. Vacuum Grip No. 61 6 Inch Angle-Grip Pliers, with Insets for Handle Pattern and Marking Detail, 1929. Fig. 30 shows a pair of Vacuum Grip No. 61 6 inch angle-grip pliers, stamped "Forged Steel Products Co." and "Newport, PA U.S.A." on the handle, with the Vacuum Grip logo and "Pat. 3-8-21" on the reverse. The overall length is 6.2 inches, and the finish is nickel plating, with some loss due to wear. The lower right inset shows a close-up of the Snap-on style date code "-9" stamped on the underside of the handle, indicating production in 1929. The patent date corresponds to design patent #D57,252. Fig. 31. Vacuum Grip No. 62 8 Inch Angle-Grip Pliers, with Insets for Side View and Marking Detail. Fig. 31 shows a pair of Vacuum Grip No. 62 8 inch angle-grip pliers, stamped "Forged Steel Products Co." and "Newport, PA U.S.A." on the handle, with the Vacuum Grip logo and "Pat. 3-8-21" on the reverse. 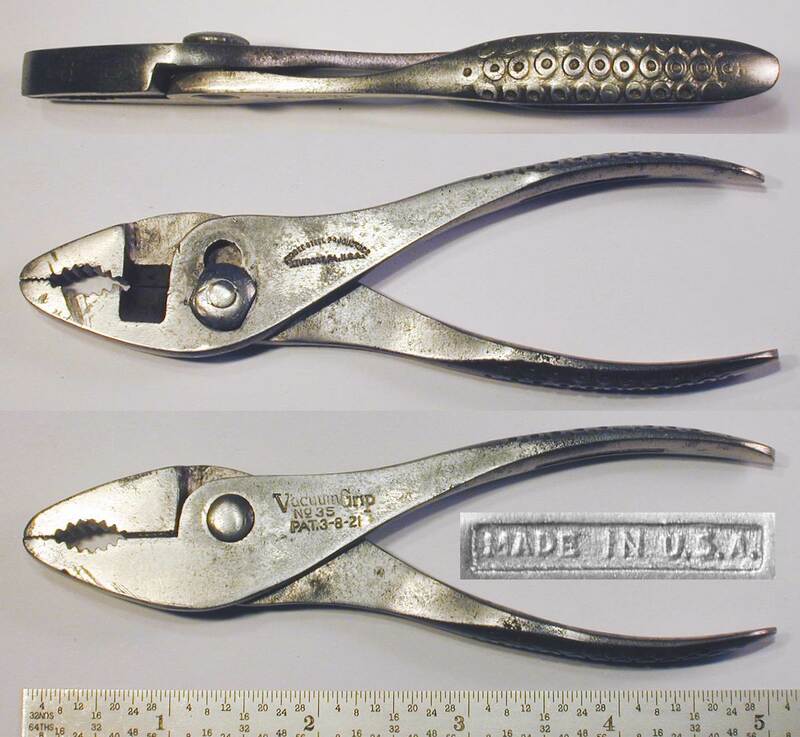 The pliers are also marked with "Made in U.S.A." forged into the underside of the handles (not shown). The overall length is 8.2 inches. The finish is plain steel with pitting due to rust. Fig. 32. Vacuum Grip No. 105 Midget Ignition Pliers, with Insets for Side View and Reverse Detail, 1929. Fig. 32 shows a pair of Vacuum Grip No. 105 "Midget" ignition pliers, stamped with "Forged Steel Products Co." and "Newport PA. U.S.A." on the handle, with the "Vacuum Grip" logo and "T.M. Reg. U.S. Pat. Off." on the reverse. The underside of one handle is also stamped with a faint "-9" (not shown), believed to be a date code for 1929. The overall length is 5.3 inches fully extended, and the finish is nickel plating. Fig. 33. Vacuum Grip No. 207 Parrot-Head Pliers, with Insets for Handle Pattern and Marking Detail, 1929. Fig. 33 shows a pair of Vacuum Grip No. 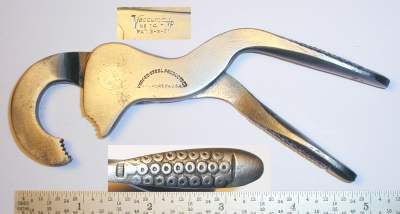 207 parrot-head pliers, stamped with the Vacuum Grip logo and "Pat. 3-8-21" near the pivot, with "Forged Steel Products Co." and "Newport, PA U.S.A." on the reverse. The patent date which corresponds to design patent #D57,252. The lower right inset shows the small Snap-on style date code "-9" stamped on the underside of the handle, indicating production in 1929. Assuming that the date code on this example correctly represents 1929, this would provide evidence that pliers were being date-coded even if not intended for Snap-on distribution. Fig. 34. Vacuum Grip No. 308 Slip-Joint Angle-Nose Battery Pliers, with Insets for Handle Pattern and Marking Detail, 1939. Fig. 34 shows a later pair of Vacuum Grip No. 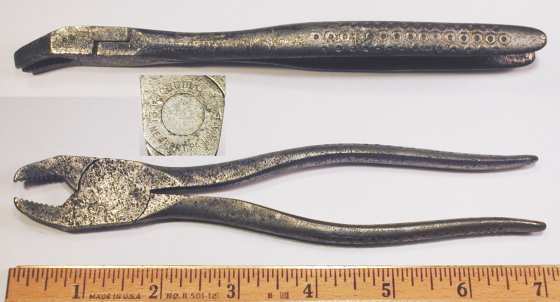 308 battery pliers, marked "Forged Steel Products Co." and "Newport, PA U.S.A." near the pivot. The inset shows the "Vacuum Grip" trademark and patent notice "Pat. 3-8-21" corresponding to design patent #D57,252. These pliers are unusual in their slip-joint design, as standard battery pliers generally have a fixed pivot. The model 308 pliers were first offered sometime after 1933, as they are not available in a Snap-on catalog for that year. These pliers have a small "9" stamped on the underside of one handle, which is likely a Snap-on date code for 1939. The "Channellock" tongue-and-groove plier design invented by the Champion De Arment company in 1934 (see patent #1,950,362) was a major advance in the art of plier making. By 1937 Forged Steel Products was offering pliers of the Channellock design, the No. 9 water pump pliers shown in the next figure. Fig. 35. Vacuum Grip No. 9 Tongue-and-Groove Water Pump Pliers, with Insets for Handle Pattern and Marking Detail, 1939. Fig. 35 shows a pair of Vacuum Grip No. 9 water pump pliers of the Channellock tongue-and-groove design. The pliers are marked "Pat. 3-8-21" on one handle, with "Forged Steel Products Co." and "Newport, PA. U.S.A." on the reverse (see lower inset). The overall length is 9.7 inches at the widest opening position. The finish is nickel plating, but with a bad case of "nickel peel" from rust or exposure to corrosive agents. Although not shown in the photograph, the inside of one handle is marked with a date code for 1939. The upper inset shows the patent notice "Pat. In Can. 1933 U.S. Pat. 1950362" marked on the reverse, referring to the well-known 1934 Manning patent #1,950,362 for Champion De Arment. This notice indicates that either Forged Steel Products licensed the patent, or more likely that this model was made for Vacuum Grip by Champion De Arment. The middle inset shows the handle pattern of the pliers, actually just stamped rings in this case, rather than the raised dimples found on wider handles. A similar pair of pliers made by Champion De Arment can be seen as the Early Channellock 420 Pliers. The next figures show three generations of the No. 56 lineman's pliers, with some noted differences in the construction and markings. Fig. 36. Vacuum Grip Early No. 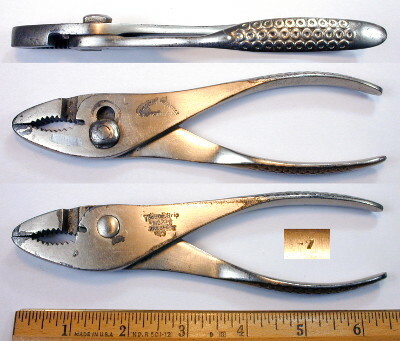 56 Lineman's Pliers, with Insets for Side View and Reverse Detail, ca. 1920-1922. Fig. 36 shows an early pair of Vacuum Grip No. 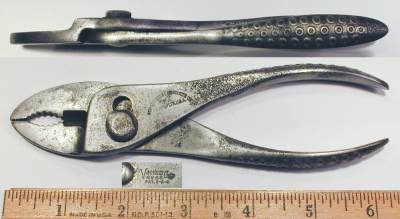 56 6 inch lineman's pliers, stamped "Newark, N.J. U.S.A." near the pivot (see lower inset). The "Newark" marking indicates an early production date, before the company's move to Newport in 1922. Fig. 37. Vacuum Grip No. 56 Lineman's Pliers, with Insets for Side View and Marking Detail, ca. 1929-1931. Fig. 37 shows a later pair of Vacuum Grip No. 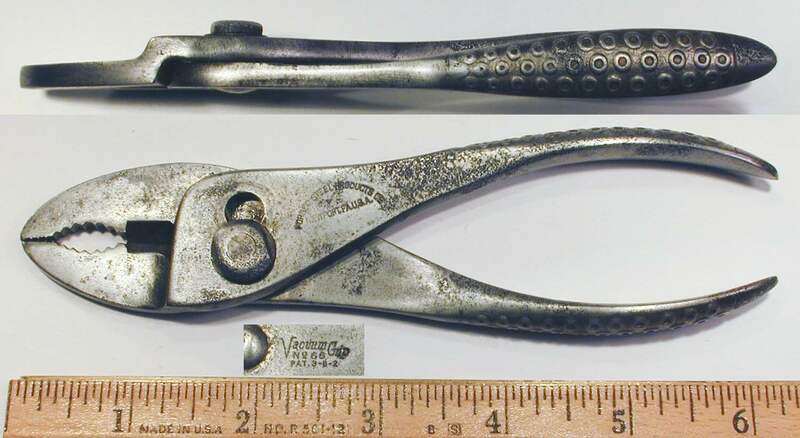 56 6 inch lineman's pliers, stamped with the Vacuum Grip logo and "Newport, PA. U.S.A." around the pivot. The pliers also have a "29" code neatly stamped across the pivot, and "31" and "5" stamped on the underside of one handle. 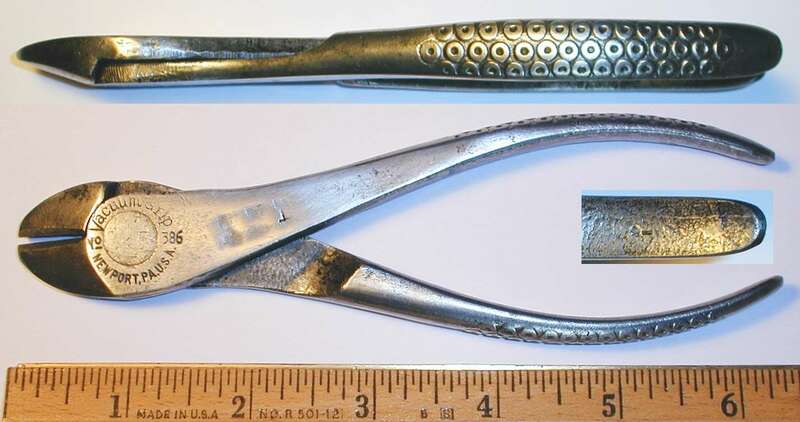 The upper inset shows a side view of the pliers, illustrating the stamped gripping pattern rather than forged-in pattern. The "29" and "31" codes may represent the manufacturing date, with the dual stamp indicating pliers sold later. Fig. 38. Vacuum Grip No. 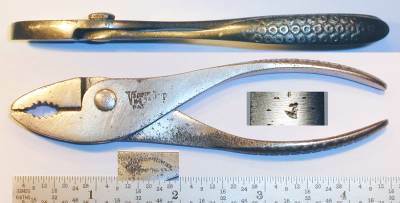 56 Lineman's Pliers, with Insets for Side View and Marking Detail, ca. Late 1930s to 1940s. Fig. 38 shows a later pair of Vacuum Grip No. 56 6 inch lineman's pliers, marked "Newport, PA. U.S.A." near the pivot, and with "Made in U.S.A." forged into the underside of the handles. The reverse is also stamped "W.M.B.A." and "Grove City, PA." around the pivot, possibly indicating that these were made for a specific customer. The circular hole in the side-cutting edges also suggests a special-order model, as this was likely intended for stripping wire of a particular gauge. Our earliest catalog reference for the No. 56 pliers is the 1927 Snap-on catalog, but the illustration there showed the lineman's pliers with rectangular heads and angled sides, rather than the rounded head ("New England" style) of the present example. The next two figures show examples of the No. 57 lineman's pliers. Fig. 39. Vacuum Grip No. 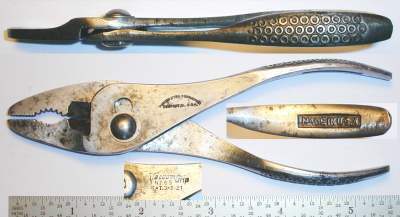 57 Lineman's Pliers, with Insets for Reverse, Side View and Marking Detail, 1927. Fig. 39 shows a earlier pair of Vacuum Grip No. 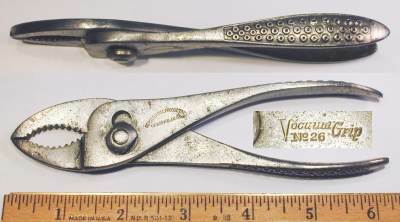 57 7 inch lineman's pliers, stamped with the "Vacuum Grip" logo and "Newport, PA. U.S.A." around the pivot. The underside of one handle is stamped with a "7-" date code for 1927 (see lower inset), and the date code is repeated on the front and back faces. These pliers have the "New England" style head with a curved outline and rounded edges. Fig. 40. Vacuum Grip No. 57 Lineman's Pliers, with Insets for Reverse, Side View and Marking Detail, 1931. Fig. 40 shows a somewhat later pair of Vacuum Grip No. 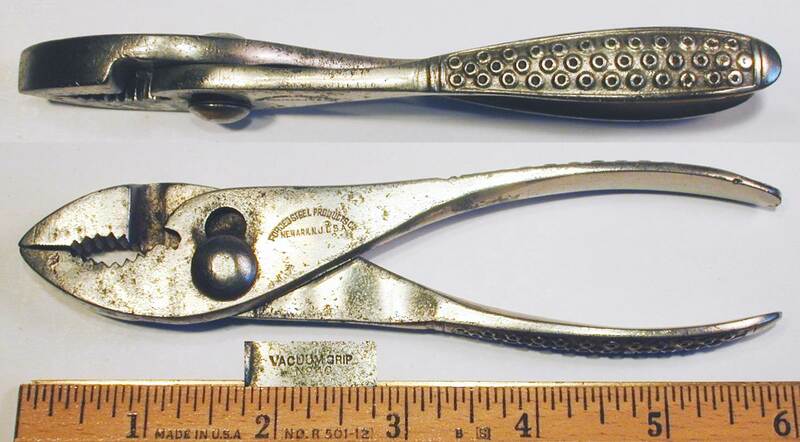 57 7 inch lineman's pliers, stamped with the "Vacuum Grip" logo and "Newport, PA. U.S.A." around the pivot. The underside of one handle is stamped with a "-1" date code for 1931 (see lower inset). The overall length is 7.3 inches, and the finish is plain steel, with some pitting due to rust. Fig. 41. Vacuum Grip No. 86 6 Inch Diagonal Cutters, with Insets for Side View and Marking Detail, ca. Late 1930s to 1940s. Fig. 41 shows a pair of Vacuum Grip No. 86 6 inch diagonal cutters, marked "Newport, PA U.S.A." near the pivot, and with "Made in U.S.A." forged into the handles. Note that the handle pattern on these pliers has been simplified, with the multiple rows of forged dimples replaced by a single row of stamped rings. This might have been done to save costs on the forging dies, or perhaps to allow the use of narrower handles. The later Snap-on catalogs make a distinction between the handle patterns, referring to the present one as the "stamped vacuum grip pattern". The next several figures show examples of the Vacuum Grip No. 87 pliers. Fig. 42. Vacuum Grip No. 87 7 Inch Diagonal Cutters, with Insets for Side View, Construction, and Marking Detail, ca. 1922 to Late 1920s. Fig. 42 shows a pair of Vacuum Grip No. 87 7 inch diagonal cutting pliers with bow handles, stamped with the Vacuum Grip logo plus "Forged Steel Prod Co." and "Newport, PA. U.S.A." around the pivot (see middle inset). The bow handles are believed to represent earlier production, but we're not sure of the transition date. Fig. 43. Vacuum Grip No. 87 7 Inch Diagonal Cutters, with Insets for Side View and Marking Detail, ca. Late 1930s to 1940s. Fig. 43 shows a somewhat later pair of Vacuum Grip No. 87 7 inch diagonal cutting pliers, marked "Newport, PA. U.S.A." near the pivot, and with "Made in U.S.A." forged into the underside of the handles. The forged marking on the underside of the handles indicates later production. Fig. 44. Vacuum Grip No. 87 7 Inch Diagonal Cutters, with Insets for Side View and Reverse Detail, ca. 1942-1945. Fig. 44 shows another later pair of Vacuum Grip No. 87 7 inch diagonal cutting pliers, in a less common variation made with plain (non-gripping) handles. 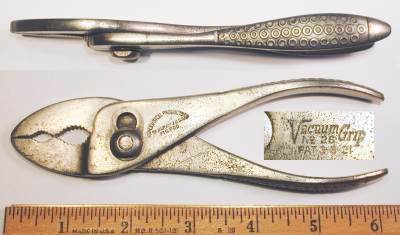 The pliers are stamped with the Vacuum Grip logo and "Newport, PA. U.S.A." around the pivot, with a possible date code on the underside of one handles. The plain handles may indicate wartime production. Fig. 45. Vacuum Grip No. 386 Diagonal Cutters, with Insets for Side View and Date Code, 1929. Fig. 45 shows a pair of Vacuum Grip No. 386 diagonal cutting pliers, marked "Newport, PA. U.S.A." near the pivot, and with a "9-" date code on the underside of one handle. Fig. 46. Vacuum Grip No. 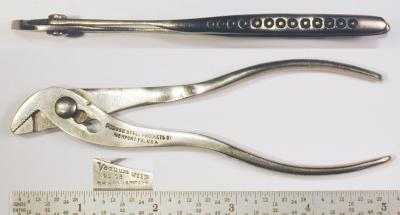 17 7 Inch End Nippers, with Insets for Side View and Marking Detail, 1930. Fig. 46 shows a pair of Vacuum Grip No. 17 7 inch end nipper pliers, marked "Pat. 3-8-21" with "Forged Steel Products Co." and "Newport, PA. U.S.A." on the reverse. The middle inset shows the "0" digit stamped into the underside of one handle, believed to be a date code for 1930. Fig. 47. Vacuum Grip No. 96 6 Inch Needlenose Pliers, with Insets for Side View and Marking Detail, ca. Late 1930s to 1940s. Fig. 47 shows a pair of Vacuum Grip No. 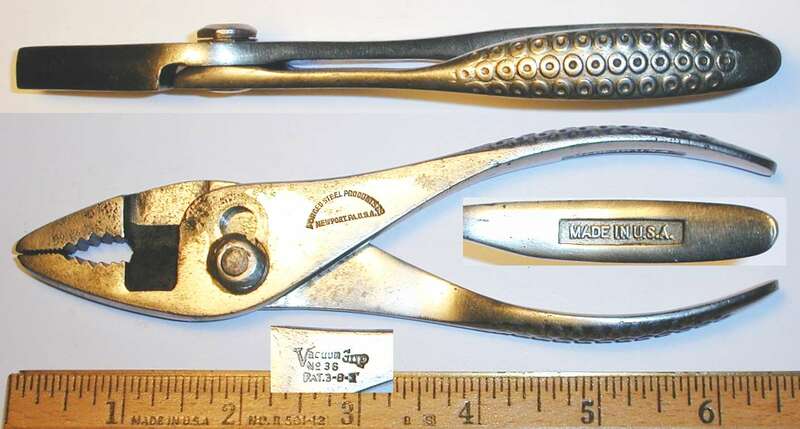 96 6 inch needlenose pliers, marked with the Vacuum Grip logo and "Newport, PA. U.S.A." stamped on the face, and with "Made in U.S.A." forged into the underside of the handles. 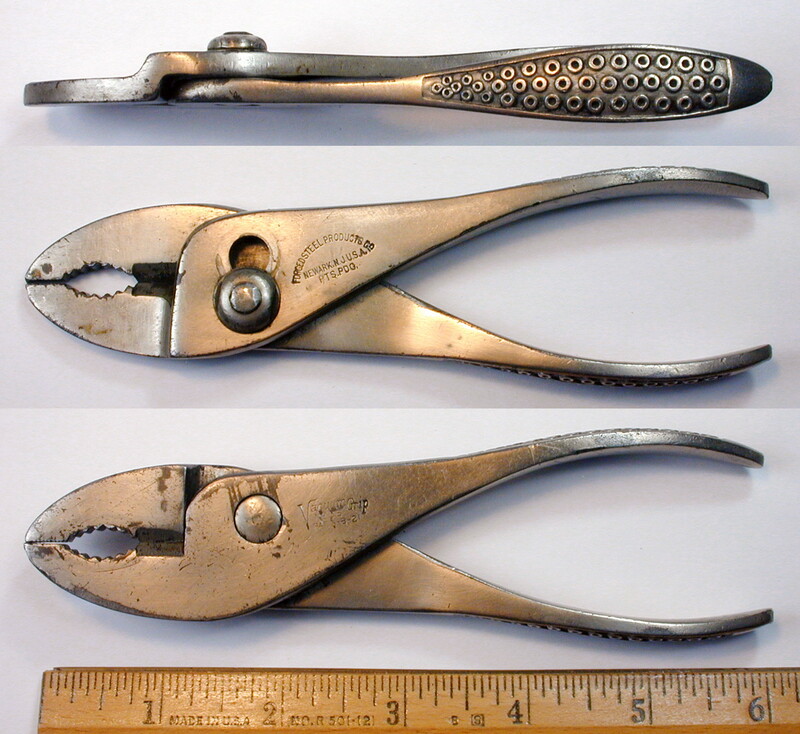 A later version of this model (after the merger with Snap-on) can be seen as the Snap-on 96 Needlenose Pliers. Fig. 48. Vacuum Grip No. 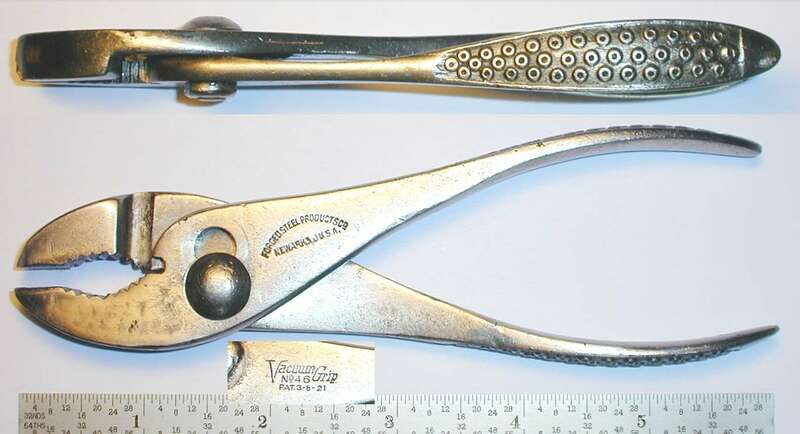 196 6 Inch Needlenose Pliers, with Insets for Side View and Reverse Detail, 1947. Fig. 48 shows a pair of (Snap-on) Vacuum Grip No. 196 6 inch needlenose pliers with side cutters, made shortly after Forged Steel Products was acquired by Snap-on. The pliers are stamped with the Vacuum Grip logo and "Reg. U.S. Pat. Off." on one side, and with "Snap-on Tools Corp." and "Newport, PA U.S.A." on the reverse (see lower inset). The reverse is also stamped with a stylized "7" date code for 1947. Fig. 49. Vacuum Grip No. 5 Midget Ignition Pliers, with Insets for Side View and Marking Detail, 1932. Fig. 49 shows a pair of Vacuum Grip No. 5 midget ignition pliers, stamped with "Vacuum Grip" and "Newport, PA. U.S.A." around the pivot. The underside of one handle is also faintly stamped with a "2" digit (see lower inset), which is believed to be a date code for 1932. The overall length is 4.5 inches, and the finish is nickel plating, with extensive losses due to wear. A later example of this model can be seen as the Snap-on "Vacuum Grip" No. 5 Midget Ignition Pliers. Fig. 50. Vacuum Grip No. 7 Battery Pliers, with Insets for Side View and Marking Detail, 1932. Fig. 50 shows a pair of Vacuum Grip No. 7 battery pliers, marked with the Vacuum Grip logo and "Newport, PA. U.S.A." near the pivot. The underside of one handle is stamped with a "+2" code, believed to be a date code for 1932. Fig. 51. Vacuum Grip No. 7 Battery Pliers, with Inset for Side View. Fig. 51 shows another pair of Vacuum Grip No. 7 battery pliers, marked with the Vacuum Grip logo and "Newport, PA. U.S.A." near the pivot. The next two figures show examples of the model 7A battery pliers. Fig. 52. Vacuum Grip No. 7A Bent-Nose Battery Pliers, with Insets for Side View and Marking Detail, 1929. Fig. 52 shows a pair of Vacuum Grip No. 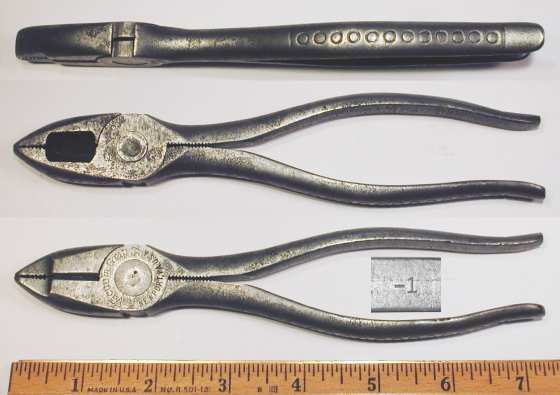 7A bent-nose battery pliers, stamped with "Vacuum Grip" and "Newport, PA. U.S.A." around the pivot, and with a "-9" date code for 1929 on the underside of one handle. The overall length is 7.0 inches, and the finish is polished steel. Fig. 53. Vacuum Grip No. 7A Bent-Nose Battery Pliers, with Insets for Side View and Reverse Detail. Fig. 53 shows another pair of Vacuum Grip No. 7A bent-nose battery pliers, stamped with "Vacuum Grip" and "Newport, PA. U.S.A." on the reverse face. The overall length is 6.9 inches, and the finish is plain steel, with extensive pitting due to rust and corrosion. In the early 1930s Forged Steel Products introduced an alternate style of battery pliers with an angled nose. The No. 308 pliers were initially produced with a fixed pivot, but later versions were made with a slip-joint (with the same model number). Fig. 54. Vacuum Grip No. 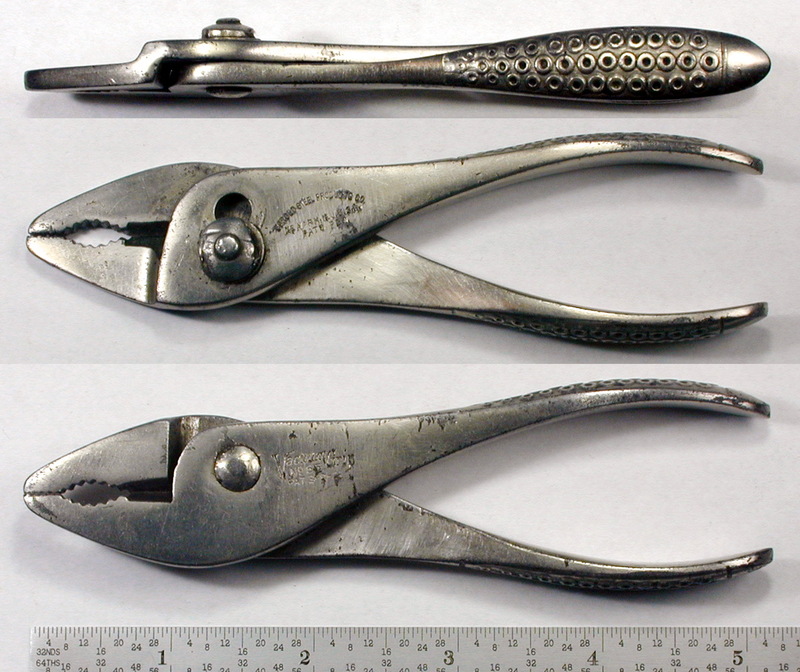 308 Angle-Nose Battery Pliers, with Insets for Side View and Marking Detail, 1934. Fig. 54 shows a pair of Vacuum Grip No. 308 angle-nose battery pliers in the early fixed pivot style. The handle is stamped with the Vacuum Grip logo and "Pat. 3-8-21" near the pivot, and the underside of one handle has a "-4" date code for 1934. These pliers are similar to the industry standard design for angle-nose battery pliers, and similar examples from other makers include the Duro-Chrome 2115 Battery Pliers, Herbrand 179 Battery Pliers, and Utica 524 Battery Pliers. The later (and more common) versions of the Vacuum Grip No. 308 pliers were made using a slip-joint design. An example can be seen as the Vacuum Grip No. 308 Slip-Joint Battery Pliers. In the late 1920s and early 1930s several makes of automobiles (e.g. Hupmobile, Auburn) were equipped with Steeldraulic brakes, a brand of mechanical brakes with an odd adjusting mechanism. Special pliers were required for making adjustments to these brakes, and not surprisingly the pliers came to be known as Steeldraulic pliers. Forged Steel Products was one of a number of companies to offer Steeldraulic pliers, and the next several figures will show examples of these distinctive No. 14 pliers. Examples of Steeldraulic pliers from other makers can be found in several pages on this site, including the Blackhawk 2581 Pliers, Bonney 2581 Pliers, Duro-Chrome 2120 Pliers, Herbrand 272 Pliers, and Utica 516 Pliers. Fig. 55. Vacuum Grip No. 14 Bow-Handled Steeldraulic Pliers, with Insets for Marking Detail and Handle Pattern, ca. Early 1930s. Fig. 55 shows an early pair of Vacuum Grip No. 14 pliers in the less common bow-handled style. The pliers are marked "Forged Steel Products Co." and "Newport, PA. U.S.A." on one side, with "Vacuum Grip No. 14" and "Pat. 3-8-21" on the reverse. The patent notice on the reverse gives the date corresponding to design patent #D57,252. The No. 14 pliers in the bow-handled style were offered in the 1931 Snap-on catalog "H". Fig. 56. Vacuum Grip No. 14 Steeldraulic Pliers, with Insets for Handle Pattern and Marking Details, ca. Mid 1930s. Fig. 56 shows a later pair of Vacuum Grip No. 14 "Steeldraulic" pliers in the standard bent handle style, marked "Forged Steel Products Co." and "Newport, PA. U.S.A." near the pivot, with the Vacuum Grip logo, model number, and patent notice on the reverse. Fig. 57. Vacuum Grip No. 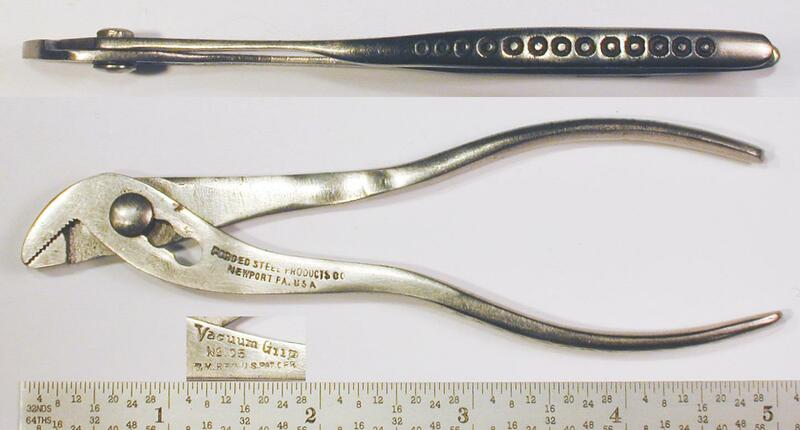 14[-B] Long-Handled Steeldraulic Pliers, with Insets for Handle Pattern and Marking Details, 1937. Fig. 57 shows a still later pair of Vacuum Grip No. 14[-B] "Steeldraulic" pliers in the bent long-handled style. 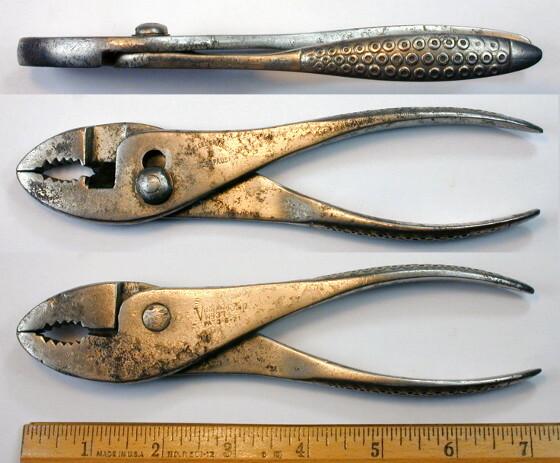 The pliers are stamped "Forged Steel Products Co." and "Newport, PA. U.S.A." near the pivot, with the Vacuum Grip logo, model number, and patent notice on the reverse. A small "7" date code is stamped on the underside of the handle, as shown in the right inset. The 1937 Snap-on catalog shows an illustration of this type of long-handled Steeldraulic pliers, which are listed as the Vacuum Grip model No. 14B. A Forged Steel Products catalog from the late 1930s also lists these as model 14-B. Fig. 58. Vacuum Grip No. 31 Brake Spring Pliers, with Insets for Marking Detail and Handle Pattern. Fig. 58 shows a pair of Vacuum Grip No. 31 brake spring pliers, marked "Pat. 3-8-21" and "Made in U.S.A." near the pivot, and with "Forged Steel Products Co." and "Newport, PA U.S.A." on the reverse. The overall length is 13.0 inches, and the finish is nickel plating. The next figures show two generations of the No. 70-A lock-ring pliers. Fig. 59. Vacuum Grip No. 70-A Lock-Ring Pliers, with Insets for Marking Detail and Handle Pattern. Fig. 59 shows an earlier pair of Vacuum Grip No. 70-A lock-ring (or snap-ring) pliers, stamped with the "Vacuum Grip No. 70-A" and "Pat. 3-8-21" near the pivot, and with "Forged Steel Products Co." and "Newport, PA U.S.A." on the reverse. The handle pattern on this example shows stamped rings rather than the forged dimples of the classic "Vacuum Grip" design. Fig. 60. Vacuum Grip No. 70-A Lock-Ring Pliers, with Insets for Marking Detail and Handle Pattern, 1948. Fig. 60 shows a later pair of Vacuum Grip No. 70-A pliers, stamped with the Vacuum Grip logo and "Reg. U.S. Pat. Off." near the pivot. The underside of the handles has forged-in markings "Made in U.S.A." with a stylized "8" date code for 1948. The lower inset shows the handle pattern, the fully forged dimpled pattern rather than the stamped rings seen on the previous example. The markings and 1948 date code for this example present a bit of a mystery. By late 1945 Forged Steel Products had become a division of Snap-on, and their subsequent production is generally marked with both the Vacuum Grip and Snap-on logos. However, this example appears not to have been marked with the Snap-on brand. Fig. 61. Vacuum Grip No. 13 Piston Ring Groove Cleaner, with Inset for Handle Pattern, 1939. Fig. 61 shows a Vacuum Grip No. 13 piston ring groove cleaner tool, marked with the "Vacuum Grip" name, and with a "9" date code stamped on the underside of one handle. The overall length is 10.4 inches, and the finish is nickel plating. One of the unusual features of this tool is its slip-joint construction, to allow adjustment for larger or smaller piston diameters. A tool similar to this is illustrated in the 1931 Snap-on catalog (Catalog "H", page 60), although it appears to have a fixed joint rather than a slip joint. Similar piston ring tools were made by at least one other company, as for example the Bog 328 Piston Ring Groove Cleaner. Fig. 62. 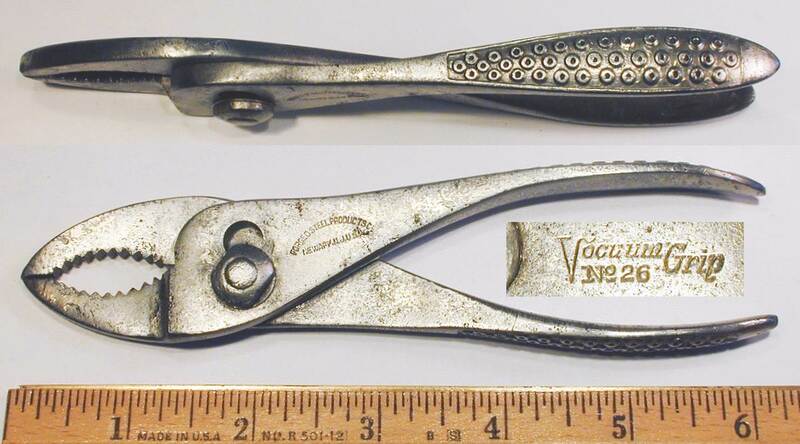 Vacuum Grip Indian Motorcycle Valve Cover Pliers, with Inset for Side View. Fig. 62 shows a pair of Vacuum Grip specialty pliers for servicing the valve covers on Indian motorcycles. The pliers are stamped with the Vacuum Grip logo and "Newport, PA. U.S.A." around the pivot. Fig. 63. Vacuum Grip 208 Tapered Punch, with Inset for Marking Detail, 1926. Fig. 63 shows a Vacuum Grip 208 tapered punch, stamped with the "Vacuum Grip" logo and model on the octagonal shank, and with a "-6" date code for 1926. The punch has a 7/16 inch octagonal shank with a 1/4 inch tip, and the overall length is 8.4 inches. The finish is polished steel. Fig. 64. Forged Steel Products No. 12 Splicing Clamp, with Insets for Side View and Marking Detail. Fig. 64 shows a Forged Steel Products No. 12 splicing clamp, stamped "Forged Steel Products Co." and "Newport, PA. U.S.A." on the face. Note that this tool is not stamped with the company's "Vacuum Grip" trademark, and that the handles on the tool are plain, without a gripping pattern.